Read my review of Beautiful Creatures! I loved Beautiful Creatures. I loved the huge fantasy world that Garcia and Stohl created. I loved the slow, meandering Southern Gothic style. I loved that it was told from a guy's point of view. I loved the unique paranormal creations - I've never read about witches or vampires/demons like these. Beautiful Darkness starts out just where Beautiful Creatures finished and continues with the wonderfulness. The Caster world only becomes more complicated in the second book. Ethan is thrust further into the fantasy world as Lena as pulling away from him. Luckily, even if he doesn't have Lena, he has his trusty sidekick Link and a new, young, pretty keeper-in-training named Liv. Lena is haunted by Macon's death and this new burden to choose between light and dark at the cost of her family. In handling her grief, she has essentially abandoned Ethan and taken up with a new creature named John, who seems like an Incubus but has a Caster's green eyes. Visions are coming to Ethan alone now - about Macon's past. It's up to Ethan to discover whatever Macon wanted him to know and save Lena. I continue to love Ethan. He's the guy every girls wants. Kind, gentle, and thoughtful without being too emo. It's nice reading a paranormal romance where the narrator isn't a lovesick girl. Even at the height of Ethan and Lena's troubles, he doesn't seem mopey. Lena on the other hand, is very emo. But the darkness in her character is so strong that her struggles and worries seem interesting rather than overdone. Link is a highlight of the series. While he is a goofball, he rises above the stereotypical crazy best friend. He's always there for Ethan. If Ethan says jump, Link will shrug his shoulders, crack a joke, and ask "how high?" He provides levity for the series but the authors give him an important role. He isn't there simply for the sake of humor. Even though the pace of the book is slow, there are so many twists and turns that it never gets boring. All the characters from the first book play a role in Beautiful Darkness along with new ones. I loved learning more about the Caster world, especially the tunnels. I realized that Amma is even smarter and more powerful than I assumed from the first book. And the connection between Ethan's family and the Caster world just grows more complicated as Ethan learns more about the past and the present. Beautiful Darkness took me awhile to get into. I enjoyed it the whole time, but I was rather confused at first. The book gets right into new content rather than spending the first 50 pages summarizing the previous book. It was refreshing not to read a regurgitated plot, but I also had to go back and almost re-read Beautiful Creatures, because I'd forgotten so much and the new book didn't bring me up to speed. Overall, I prefer having to go back to the first book over wasting words with summarization in the second book...I just finished re-reading Beautiful Darkness a second time, starting it immediately after Beautiful Creatures. Not having any lag time makes a huge difference in continuity and minimizing confusion. The only other big complaint I have with this book comes right at the end. A huge plot twist felt like it was handled too casually, like it just wasn't that big of a deal. This is going to be a huge part of the third book (at least I presume so) and I am so excited for it; it's a great twist. I just wish it had been introduced better. 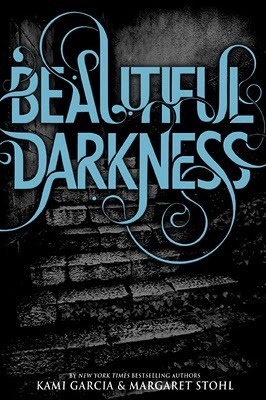 Beautiful Darkness was a great addition to the Caster Chronicles. If you liked Beautiful Creatures, you'll definitely like this one. And by the end, you'll be dying for the third book to come out. I'm glad you enjoyed this one. I bought book 1 and 2 at the same time and haven't gotten around to reading them yet. So I'm glad the second book is good as well. Thnaks for the great review! Great review. Now I LOVED Beautiful Creatures, but for me this book was a bit of a disappointment. However I'm still looking forward to the next book. Great review! I have still to read Beautiful Creatures, it's been on my TBR pile for ages now! Loved this series! I am so ready for the next book! So glad I read this review Alison! I was wondering if I'd need to go back and re-read Beautiful Creatures before tackling this one since it's been a while, and it seems like that might be helpful. I adored Ethan in BC, so I'm really excited to spend more time with him! Good review! I think the beginning was a tad slow for me because I was so sick of Lena's depression! Wow...that girl was sad. Still need to read BD and hope to get to it before BChaos. I'm really excited to become reacquainted with the characters again. You are so right about Ethan. He has got to be one of my favourite guy MCs ever! Hmm, I too might need some refreshing before getting into BD because it's been awhile. This book really does sound awesome! I'm loving the sound of the dynamic between Ethan and Link. It seems like a very true friendship. For me, it's all about Ethan, though. Like you, I think he is an incredible character. So much as been put into his development, and I'm happy to hear that he isn't moping around, falling apart without Lena, who as you said, is way to emo for me. Totally can't wait to read this book. AWESOME review. Great review! I haven't read this 2nd book yet, but I agree it's nice reading a paranormal from a guy's perspective! Your review only confirms my thoughts on reading this series when all of the books are out. I do like the sound of it though. It's nice to read a male's pov in a paranormal romance, which almost never happens. I think I've only heard awesome things about this series, but I've never actually read any reviews, hehe. I love the sound of it, I should get started on it soon! Thanks for the review, Alison!